Steve Cooper looks back to the early 1970s, and the introduction of Yamaha’s fiery CS5E & RD200 models. 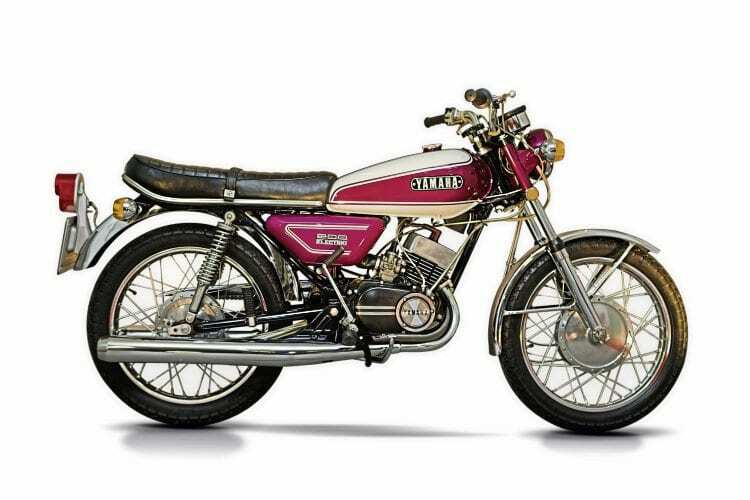 As was observed a little earlier in our series on Japanese 175-200s, Yamaha’s early CS series motorcycles really cut the mustard when it came to performance and value for money. Even as the final batches of CS3s were leaving the production lines, Yamaha had a game plan for the plucky little 200s that, arguably, was streets ahead of the opposition’s. The ‘glam rock’ Europa styling applied to this CS5 fitted in with Yamaha’s corporate look of the time. 1972 saw the introduction of the purple and white CS5E that still borrowed much from its predecessors yet looked distinctly different. Eschewing the overtly 1960s styling, the new bike ran a new peanut-profile tank alongside significantly more angular panel work and a seat with a distinct kick up at the rear. Also gone was the restrained and genteel pin-striping that had characterised the older models. Swirling white and candy purple paint for the tank was neatly counter pointed by purple panels bearing white C form graphics. It all looked rather bold glam rock, yet it fitted in with the corporate look that Yamaha had launched globally. The so-called Europa styling lifted Yamaha’s entire range, and even now remains instantly recognisable. If the external appearance was distinctive, then what was happening inside the engine was even more dynamic. Even though the bottom end of the motor was still based around the older CS engines, the top end had received a serious makeover. Gone were the round barrels and trimmed-down cylinder head fins, for the CS5 ran square barrels and heads that had been subtly breathed on. Previous Post:PROJECT 90: How to go about measuring up! Next Post:Wat box was that, did you say?